How to Play Videos with MX Player on Android Devices? Q: "I just bought a LG G Pad and put some videos on my Android Pad, but now MX Player can't play the videos correctly. How to solve?" MX Player has long been one of the most popular video player apps for Android devices. It stands out as a high-quality app in a category saturated by unoptimized or ad-infested players and plays almost everything smoothly. However, some users complained that MX player can't play these videos downloaded from YouTube, Whatsapp and DJI Phantom, GoPro Hero cameras. 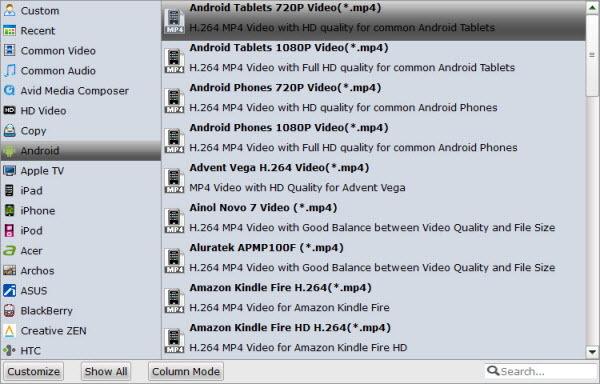 So, we'll share the best way to play all videos with MX Player on Android Devices in this simple guide. From MX player official website, we have know that it supports these video formats best: AVI, MPEG, MP4, WMV, DivX, Xvid, MOV, FLV, VOB, 3GP, etc. Before you put your videos onto Android devices, you'll need to transcode and convert these videos to Android Phones/Tablets MX player more compatible i.g. H.264/AVC MP4, MPEG-4 formats in advance. The job can be done effortlessly with the help of Brorsoft Video Converter Ultimate (Win /Mac). It's an all-in-one video, audio, Blu-ray and DVD converter that capable to convert virtually any video/DVD/Blu-ray files to all popular video/audio formats like: H.265/HEVC, AVI, MP4, WMV, FLV, MPEG, MOV, MKV, and more. Besides, it provides customized presets for 150+ popular formats including iPhone, iPad, Samsung, Android, Xbox, PS3/PS4, Apple TV, and more. Thanks to the built-in editor you can edit videos in your way (crop, trim, volume, subtitle, watermark and effect). Step 1. Install and launch the best video converter for Android MX Player, simply click Load File to load your videos or click Load Disc to import Blu-ray/DVD movies to the program. Step 3. With above settings, tap Convert button to convert Videos, Blu-ray/DVD movies to MX player and Android supported formats. After the conversion, you can click Open to get the result videos, then transfer and play the converted videos with MX Player on Android tablets and phones without hassle.